Entrepreneurs have always been a rare breed. And, as the U.S. employment rate has improved, the overall rate of business creation has fallen from 0.30 percent in 2012 to 0.28 percent in 2013, according to the annual Kaufman Index of Entrepreneurial Activity. All age and ethnic groups experienced declines, except for the 45 – 54 year-old group. Furthermore, according to the U.S. Small Business Administration, over half of all new businesses fail within five years. So is it any wonder that many small business owners feel like they are isolated, misunderstood and lacking in the guidance and support they need? ICON14, held in Phoenix last week, represents Infusionsoft’s flagship commitment to help small businesses. In addition to offering attendees the prerequisite tips and tricks to get the best results from its solutions, Infusionsoft provided its 3,000-plus attendees with insights and expertise needed to create thriving, sustainable businesses and achieve work-life balance. ICON14 featured both entrepreneurial leaders, including Simon Sinek, Seth Godin, JJ Ramberg, Jay Baer and Peter Shankman, as well as its all-star small business customers, to help guide entrepreneurs to beat the odds and create successful enterprises. 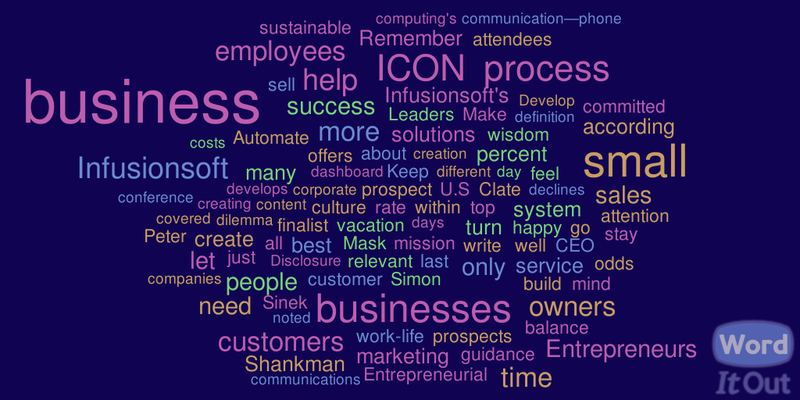 These speakers and Infusionsoft executives imparted many pearls of wisdom during the conference (check out the Twitter hashtag #ICON14 for more). But here are a few that really made an impression on me and that I wanted to share. Develop a positive corporate culture. Most businesses view happy customers as key to success. Yet what are the odds of creating happy customers if you have miserable or just unmotivated employees? As Simon Sinek (@simonsinek) noted in his talk,“Leaders need to set a circle of safety within their organization so their teams can do wonderful things.” Employees who feel appreciated, included and recognized are your best business advocates. See my interview with Infusionsoft’s VP of People, Anita Grantham (@anitakgran) for great ideas on how to build this type of culture. Establish a system to grow. Entrepreneurs should take advantage of cloud computing’s “no infrastructure investment required” model to help kick-start and organize their businesses for sustainable growth. Small businesses can use technology to enhance relationships by taking the friction out of process and freeing up more time to focus on customers. Systems also enable small companies to scale more easily and maintain better work-life balance. When the owners of Cleancorp (@CleancorpAU), an Australian commercial cleaning service and the ICON14 winner, did everything manually, they had no time for vacation. Since they began using Infusionsoft to automate sales and marketing, they’ve grown the business 575 percent, and the two co-owners took 9 and 13 weeks of vacation last year. Once you have a system in place, let go of process and let employees do their jobs. As Clate Mask says, business owners need to spend more time working on the business and less time in it. Or as Christian Isquiedero, CEO of Left Foot Coaching and ICON finalist put it, business owners should ask themselves, are they buying you or your process and mission? “You aren’t scalable, but your process and mission is. So build a system to “Verify, Clarify, Document, Teach and Automate.” Let go of the block and tackle, let employees do their jobs and manage what’s going on via a dashboard. Remember the sale starts with “No.” Small businesses that succeed follow-up regularly with prospects to stay top of mind for the next opportunity. Keep connecting with people every day, not only to sell, but to be there when the timing is right, according to Peter Shankman (@petershankman). Personalize communications with emails, offers and campaigns tailored to different prospects’ histories and behaviors. And don’t forget to integrate offline communication—phone calls, events, on site meetings, etc. with online activities to help humanize the business. Be relevant, brief and write well! Also from Shankman: With so many ways for people to get content these days, you need to find out what your audience wants and how they want it. Make sure you communicate relevant information, or people will tune you out. Remember that attention spans are shrinking; you have just 2.3 to 2.7 seconds to capture someone’s attention, so keep it short and sweet. Finally, learn to write or hire someone who can. Poor writing is a turn off. Make your sales process a customer service process. Heather Lemere (@salonbusiness), owner of Salon Success Strategies, a marketing agency for salons and spas and ICON finalist, uses strategic lead qualification to reduce high sales costs by eliminating bad leads to focus only on the best prospects. With a smaller but better qualified prospect pool, you free up time and resources to turn the sales process into an educational customer service process, which in turn helps close more business. The wisdom, camaraderie and energy at Infusionsoft was truly amazing. Not only did it help educate and inspire those of us that are already pursuing our passions as entrepreneurs, but it should also help motivate those who have been tentative about making the leap! Remember, YOU create your own opportunities—don’t wait for an employer to do it for you!